The first thing you need when you want to build massive muscle is a good diet, and I cannot stress that enough. Good eating habits are crucial to your success, and a bad choice in diet can slow down your growth tremendously. So, listen up! Tip 1. Eat regularly, every two to three hours or so. Your body can only absorb a certain volume of nutrition during each meal, so eat often. Also, remember breakfast. Tip 2. If you are not gaining 1 – 2 pounds of muscle a week, you are not getting enough calories, and need to add more to your diet. There are many good calorie calculators online that you can use as reference. Tip 3. You have probably heard that protein is important for muscle growth, and that is absolutely true. You should try to get somewhere around 40 – 60 grams of protein with every meal. This of course depends on your weight. Tip 4. Aim to get about 60 -80 grams of carbohydrate with every meal as well. Carbs play a big role in giving you energy. Try to get most of your food from whole foods, like meat, vegetables, nuts and seeds, fruits, etc. And stay away from foods like cereals, cookies, and foods with a lot of additives. High intake of fruit and vegetables in also very important. High intensity is the key to fast muscle gain. You should treat your body building workout routines like it’s a job that you have to work hard on in order to succeed. With every set, you should push yourself to the point of fatigue, No excuses. Tip 1. Treat your first and your last set, like it is the last one you will ever do. Give it your max! Tip 2. Always have your end goal in mind. You must know where you want to go, if not you will never know when you have arrived. Hold a clear image of your ideal body in your mind. Tip 3. Lifting the same weights week after week will make your muscles lazy, and you are the one to blame. You should gradually increase the weights that you lift, always give your muscles reasons to grow. You should be able to do 2 – 3 sets, but no more! Tip 4. 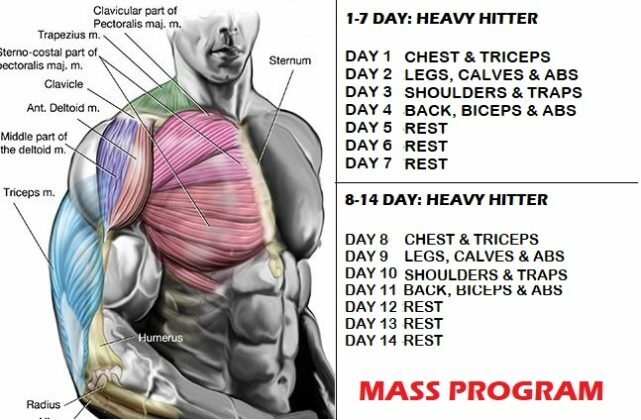 Your muscles will not grow in a slow 2 hour session at the GYM, your muscles grow when you force them over a short time span. So when you lift you should always do so as fast as possible without straining your posture. Tip 5. Exercises such as bench press, squats, dead lifts, rows and military presses are among the top body building exercises. Tip 6. Don’t over exercise yourself, remember to give yourself adequate rest in between your sessions. THIS is when your muscles build new tissue. You need to feel your way to what is the right amount of rest days for you. Remember if you feel the previous workout in your muscles as pain or soreness, etc, you need more rest!